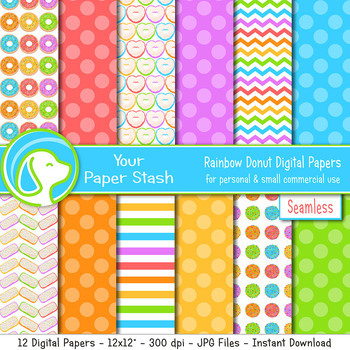 Use these rainbow donut themed digital papers to to create birthday party decorations, scrapbook pages, cards, gift tags, planner stickers and in many other creative projects. Most small commercial use is fine, see below for more information. ♦ Images shown in the preview image are lo-res. You will receive all hi-res files. Find more digital paper packs here. Bookmark us and check back often for new digital items. Thank you for visiting! • You may use them in many ways for your PERSONAL classroom creative projects such as, bulletin boards, PowerPoint presentations, classroom newsletters, digital scrapbook pages, etc. • You can use them COMMERCIALLY to create banners, business cards, digital cards, planner stickers, party favors, and other creative projects. All end products must be in a flattened format and include your own creative pieces, and styles to make it a new design. A link back is not required but always appreciated. Link back to Your Paper Stash. • You may not share, resell, redistribute as is in part or whole digitally or in printed format. This includes changing hue/saturation and claiming it is new. • You may not claim this work as your own either in the original format or in an altered format. Original image background copyright belongs to Your Paper Stash. • You may not include any of the images AS IS in scrapbook kits, layered format, clipart kits, as brushes or patterns, collections, etc. • Be creative, add text, elements, and other items to create a new work. These digital papers are meant to be a tool, not your entire project. This is a digital download. No physical files or printed copies will be sent. Once your payment has been processed you will be able to download the files in your TPT account.